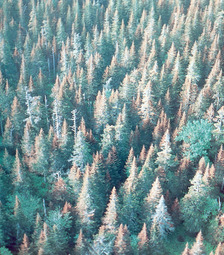 Approximately every thirty to forty years, forests across northeast North America are threatened by feeding damage from spruce budworm, a small caterpillar that feeds on the buds of spruce and fir trees. We are approaching the time when spruce budworm will once again be an issue throughout regions of the United States and Canada. Because forests provide so many benefits to local communities, including jobs and recreation, understanding the opinions of local residents is vital to addressing this issue. In order to do this, we are asking you to respond to a survey regarding spruce budworm in your area. This survey will be used as the basis for a graduate student research project, to assess the opinions and concerns of residents on an issue which encompasses the economic and environmental impact of forests. Your participation is incredibly valuable, and the information provided will be used to help facilitate a role for the public in natural resource management. Responses are anonymous, and no personal identifying information is required to participate. Questions about the survey can be sent to the supervising professor at the University of New Brunswick, Dr. Stephen Heard at sheard@unb.edu. Thank you for your willingness to assist in this project!